Have you heard about the Plane Readers from GoNOMAD? These ebooks are designed to be read on the plane on the way to where you want go for vacation. We have designed these books to offer readers ideas about where to go, and plenty of photos to inspire them. 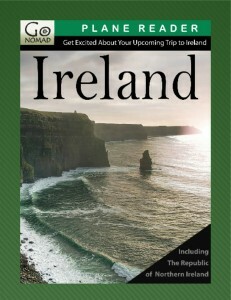 The latest edition in the series is the Ireland Plane Reader, in which we include more than 23 articles about all things Ireland and Northern Ireland. Ireland is a big time favorite destination for Americans–there are so many Irish immigrants here and so many of our grandparents once lived over there. Visiting Ireland is always a musical and beer-fueled experience, since no Dublin pub worth its salt doesn’t include a few musicians playing and the pints of Guiness flowing. Ireland is also a big biking destination…there are many companies that offer guided bike trips to show you the pretty flat land and the millions of stones from which the ancient Celts built houses, churches and plenty of stone walls. You’ll find a feature story about a bike trip through Ireland, in addition to many tales about Dublin, taking a self-guided cruise from the Republic to Northern Ireland, and other stories about lesser known sites like Doolin and Valentia Island. The Boston Boy Visits Dublin: Wicked Brilliant!